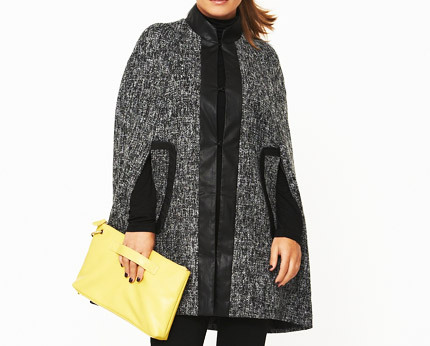 This tweed cape is from the collection by Coleen and it’s a super stylish choice! It showcases all the current trends and it’s a great way off adding some stylish oomph to your current wardrobes without breaking the bank. It is suitable for all ages and can be layered to fit your own personal tastes. 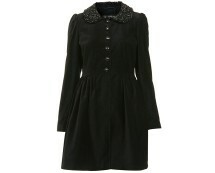 This design is an oversized fit cape with arm holes and toggle fastenings to the front. The lovely tweed fabric looks incredibly luxurious and is set off with a faux leather trim to the front edges and faux pockets; faux leather is bang on trend right now and if you have not already introduced this look into your wardrobes then here is a subtle way of doing so! Team this cape with a long sleeved jersey top or a fine knit jumper and add a pair of skinny jeans or leggings with shoe boots and you are good to go!